Aaron was still blushing as they reached the room. He thought bartenders were always forward like that, but it hadn't made the situation any less awkward. "Sure, go ahead." While Koe was in the bathroom, the werewolf busied himself by fiddling with absolutely every piece of furniture in the room, sometimes getting down on his hands and knees to peer underneath something to see anything had died underneath of it. He repeatedly twitched the curtains open and then closed again, marveling at the colour of the night through the foggy glass. He took off his shoes and felt how rough the wooden planks were beneath him. Elza flicked Faron on the forehead as she passed him, flashing him a grin. She nodded to Takeo as she passed him, tilting an imaginary hat. "Hello, baby. What can I get you?" the bartender asked, wiping a glass with a rag before placing it on a shelf. "Two . . . two rooms? I guess? And we're with Takeo." Elza responded, watching as the woman hooked two keys off of a rack and passed them to her. The elf thanked her and tossed one key to Atalia before turning to Faron. She saw the bartender make a rude gesture, but did her best to ignore her. "Go ahead and get a drink, if you want. I'm going up to room. I'll leave it unlocked." Faron nodded, shooting a slight glare at the woman before getting a pint. He sat down next to Xavier, who looked like he was about to drop. "You ok Xavier?" Faron asked, taking a large gulp of the ale. Xavier groggily turned his head towards him, blinking slowly and just nodding as he continued to drift in and out of consciousness. Faron drank the rest of his pint in silence, and as soon as he finished he stood; giving a curt nod to both the boys before walking up to his room. He walked in, "Hey it's me," He called, shutting the door behind him and locking it. Xavier finally passed out, the events from the day having taken a toll on him, Takeo just chuckled, making sure Viola wasn't watching before he (with some difficulty) picked Xavier up. He was light, lighter than he would've imagined at least. He supposed considering the fact Xavier was tree nymph he'd be a bit heavier with all the extra... Tree stuff. He opened the door to the room, and gently placed Xavier on the bed. Soon falling asleep himself next to him. Koe walked out of the bathroom, fresh, clean, and wearing extremely lacy underclothes her new shirt and trousers, although the shirt wasn't buttoned up fully in the back. While Koe was in the bath, she once again felt the sensation of her tribal's reappearing. But she couldn't get a clear look at them. "Aaron?" she whispered. Walking over to him, "How does my back look?" She asked quietly. "What do the nomadic tattoos look like? Are they ok?" Koe could see her blue markings snaking up her arm, and she knew they were on we neck, and everywhere else. So having some possibly missing was an alien thought to her, as they had always been there. She put up her wet, singed, and now choppy hair into a ponytail. Deciding that she would have to fix it later. Atalia caught and grasped the keys in a loose grip, and swung them between her fingers. The scents of various flavors belonging to the tavern's alcohol swarmed around her, but she couldn't bother with such leisure activities today. Atalia didn't waste time heading back to her room, washing her clothes and taking a dip in the bath. The steam fogged up the mirror as she lay in the tub, her hair neatly curled into a bun. The Ram spirit felt the fatigue and exhaustion lift from her body as she soaked in the water. The effects of the healing she'd performed were finally ebbing away, but Atalia was still concerned. She stroked a strand of her hair with slender fingers, pondering about the events of today. It definitely wasn't going to be safe tonight, or the days after. What am I going to do? Elza had gotten one of the fastest baths ever and changed back into her dirty, somewhat tattered clothes, as she hadn't gotten her hands on new ones yet. The water had made her injuries sting even more, and she never had been a fan of hot water, anyway. When Faron walked in, the bathroom door was cracked open so she could hear him come in, and the elf was seated on the edge of the tub, struggling to clean the gouges on her right shoulder. Aaron inspected Koe's back, not really knowing what to expect. Her skin was mostly healed, but still looked somewhat raw, and Aaron suspected that the scars would be staying. The skin was covered in swirling blue lines in varying shades, which probably meant various shades of surfacing. "They look fine to me. They're really beautiful . . ." He traced one with his finger, but then remembered that he was touching Koe's back and that was really awkward, and jerked his hand back. Koe let out a huge sigh of relief. "Oh thank the gods," she whispered, turning around and finishing buttoning up her short. Then she yawned, walking over to the bed and plopping down on it. Shimmying under the covers. "Good night Aaron," She whispered. Faron walked into the restroom, a smirk slightly forming over his face. "Are you having a bit of trouble there?" He asked, swiftly walking forward and taking the rag from her gently: starting to clean it for her without making it hurt too much. "Why didn't you have Rosa or Atalia heal you?" he muttered; kneeling down so they were eye to eye, and moving closer so he could clean the wound better. "Just Stupid,"
Elza blushed slightly, shifting her weight so that Faron could clean her shoulder without much trouble. "They had both already done so much for us, and they looked so tired . . ." The witch girl had fallen on her face for them, literally, and almost gotten kidnapped by Armistice. Of course she didn't really remember most of it, but Elza felt bad for having dragged her into it like that. And then Atalia had nearly collapsed as well, having spent most of her energy reviving Aaron and Xavier. Even if she was a jerk, Elza felt she owed her immensely. "Good night." Aaron whispered, before heading into the bathroom to get himself clean. Afterwards, he changed into his new clothes and crawled into bed carefully, trying not to wake Koe. Hesitantly, he kind of found her hand and held while drifting off into sleep. "Well neither Koe or I wanted to get healed but we did anyways," He whispered, finishing his cleaning of her wound. "Good. All nice and clean," He mummered, moving closer to Elza and hesitantly pressing his lips to hers. He pulled away slowly, kinda shocked at himself, before he did it again, this time taking her face in his hands and deepening it. "Thank yoMMFF!" Elza said, her words getting interrupted by Faron's kiss and turning into a tiny hitch of surprise. And then he pulled back, and she barely had the time to look at his eyes before he was kissing her again, his long, slender fingers gently cupping her face. Elza kissed him back as equally as passionately, her face flushed and eyes closed. The events of the day were forgotten, and all there was was Faron and their mouths together. Faron slowly pulled away, letting it linger before he realized what he just did. His eyes widening and his face turning very, very, red. "Oh-I.. I-.. Uh.. Sorry.. I - uh.." He stuttered before standing up quickly and walking out of both the bathroom and room. Shutting the door quietly and leaning against the stretch of wall next to it. His hand covering the bottom half of his face, which was still bright red. 'Did I just. Is she ever going to talk to me anymore? Oh my flying Ghethora' He thought, panicking. Elza sat on the edge of the tub for a moment after Faron walked out, her brain attempting to process what just happened and failing. Her face suddenly grew so red that she must have been in danger of a heart attack, and she wandered into the room, fell over onto the bed, rolled under the covers, and pulled them over her head before scrunching into a ball of feels. Faron noticed the rain had stopped, and he closed his eyes, attempting to turn into a bird or.. Even a mouse. Nothing. Not yet. He figured he would need some sleep, so he stole some blankets from a nearby empty room, and walked back into his/Elza's room. Laying a blanket on the floor and pulling the rest over him. Falling asleep quickly, his face still very very red. Armistice's eyes slowly fluttered open. It was still a bit early in the morning, but the sun had risen, so it must've been a good time to get up. He snuggled deeper into his pillow and tried to get more sleep, but then it occurred to him that he'd fallen asleep holding his pillow, and his arm was definitely still occupied. He opened his eyes a bit, and noticed that he was staring into pure white hair. Oh, he must hugging Will from the back. Eh, he's warm, so Armistice cuddled into him instead. It was nice. Will stirred slowly, the sun peeking in through a gap in the curtain and shining in his eyes. He tried to escape it by burrowing back under the covers, where it was nice and warm . . . when he realized an arm was wrapped around him. He almost yelled in surprise, lurching away from Armistice and right off the side of the bed, landing with a crash on the ground and pulling half of the covers off with him. Armistice jolted upright, the noise causing him discomfort and rousing him from his lazy state. His eyes darted back and forth, until he realized Will had fallen onto the floor, and the crashing sound that had forced him awake was caused by this. Armistice inched over to Will's side of the bed, and looked over at him. "Hey, Will. What exactly are you doing? I'm a bit confused by all the noise, and you on the floor, cause if you needed someone to sleep on the floor, I said I'd do it. So what are you doing?" "Nothin. Absolutely nothing, Arm." Will growled, getting to his feet and throwing the blankets back onto the bed and on top of the fairy's face. He quickly pulled on his cloths, including his cloak, feeling the tiny vial bump against his side. He had to get the timing right. Being in cat form, Kioshi was curled up inside a random cabinet at the inn. She pushed open the door with one of her paws, and jumped out. She then transformed back. 'Hmm... what to do now?' she thought. She then walked around the inn for a bit. His birth name, if that's what you mean, is Six. But he prefers to be called by the name he has chosen, Habit. He's smart, smart enough to be a high demon, and smart enough to think like most other species. He's rather ruthless and cunning, psychotic and deceitful. He's also quite good with the illusions of words and of looks, and yet although he may seem the perfect demon (He thinks he is after all) His flaws are many, as he will put winning the game far above his own life, he lives for having the last word, he HATES losing, he's extremely arrogant, and also his love... For the elf Elza. That's his greatest weakness, and his best kept secret. He also has no reservations about killing his own demon brothers and sisters. Because he doesn't care for them, they do not suit well with his games and he believes them all stupid, dull, and beneath him. Besides the High. But he doesn't bother with them anymore. Habit also has an unprecedented love for curse words and knives. Plus he likes eating people. That's always fun. Characteristics - Well if you mean by the way he looks. He looks human, or at least, not like a demon. He also is clever, very clever. Good with illusions of the mouth and of illusions of how he looks to other people, figuratively of course, he doesn't have a single drop of magic in his black blood. He has a preference over knives, and he keeps a small collection of them in his vest Ranging from large to small. He uses them for many different... Recreational activities. And he's quite skilled with him. But he does not throw them. He is suited for close combat only. Six, sorry, Habit, was always avoided by the others, excluding the High, who took him from his stupid, boring, dull parents at birth. He was raised by them, cultivated to be one of the High. He excelled, his mind and his appearances surprising everybody, coming from The Low as he was. His glory turned to ash however, as he led a a horde of Low's and Middle's to attack a certain area of the forest. Where he saw Elza for the first time, he... Tried to not engage from that battle. Telling his blood thirsty, stupid demons to withdraw. They made the decision not to, and attacked anyways. The idiots got themselves killed. He went back to the High command, angered and mystified. He demanded why he held no authority over them, and the High simply answered that he did not look demon, and hence, they did not see him as one. Habit grew extremely angry at this remark, drawing one of his signature knives. as if... In decoration. Habit was nowhere to be found. That's when his games began. He's had millions across his tables, he's done horrible things to people. Mauling them, tearing them apart. Eating them alive, killing everybody they loved, everyone they were closed to, just to mess with their heads. He took a particular fascination with various knives, due to their stealth and their availability, after a particular game where his victim had shown him the various uses and such of knives before Habit played his favorite "Oh yeah I was planning on killing you the entire time," tid-bit, and well...killed him. He remembers Elza still vividly, and in between his games he would always go looking for her. Sometimes finding her, sometimes not before he engaged in another chase or two. Sometimes managing a couple games at once before trying to find her once more. Other- He keeps his goggle/spectacles on top of his head, and has a bit of a soft spot for them. Koe woke up groggily, pressed against Aaron. She opened her eyes, face to face with Aaron. And shut them quickly, not wanting to wake him up. Or more for him to know she was awake. She just wanted to lay there and just... Well keep that warm feeling of just waking up, like she just had a good dream and she didn't want to let to of it. Faron woke up, sore from sleeping on the floor. He groaned, sitting up and rubbing his head. Then wiping his face before he remembered what had happened that night. He turned red, his eyes widening. 'Oh. Oh. Okay. Um... What to do? Ummm...' he thought panicking slightly. He would have no idea how to proceed if Elza woke up. ((Suzuka, I'm making a character who's a demon, and I'm wondering if it's okay for me to make her a little bit in love with Habit? Intellect/Personality - At first, Cy seems like a girl who looks older than she is. She acts childish and adorable, and it's hard for strangers to dislike her. She also seems so lost, defenseless, and vulnerable, leading to others wanting to protect her. Of course, this all appears to be an act. It's easy for her to hide that she's a demon, because she can look like an ordinary girl. The true Cy does not need help at all. In fact, she is quite independent and strong. During combat, she is decisive, swift, and makes her choices quickly, though sometimes thoughtlessly. She is constantly alert and ready to deliver out a quick judgement. She does not hesitate to strike down someone who has once helped her if it benefits herself. Cy also has many mood swings, sometimes going from ecstasy to fury, giggling to screaming. She is ruthless, merciless, and does not care for others' approval (except for maybe Habit's). To most people, Cy looks like a adorable blue-eyed, blond-haired, small girl who is thin and weak. 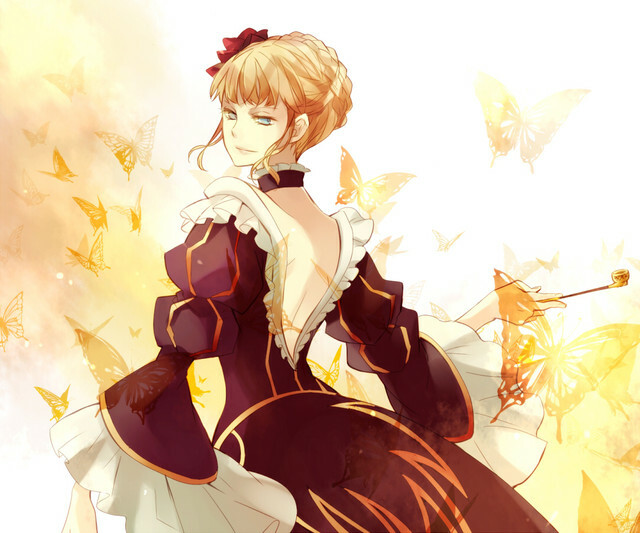 In reality, though she does look rather like a human, she has red eyes and large black wings and is much taller. She does have blond hair though. Powers - She can hide certain aspects of things. For example, she usually can't change what others see, but she can hide certain things, such as her wings. If it's something she knows very well, then she can slightly alter its appearance (such as her eye color). Another example is if two people are talking, she can "hide" the sound so that the two can't hear each other. Weapons - Cy uses a very large, but somewhat slender sword. It's both brutal and elegant, making it a formidable weapon. She's been using that sword for around sixty years, so she's quite good with it. If it fails, she has a smaller, easily hidden dagger. The tip is coated with lethal poison. History - Cy was found alone by a riverside when she was very young. A human family took her in, but when her adoptive father became abusive, Cy's demonic personality emerged, and she killed him in a moment of fury. She then decided to destroy the whole family and their belongings, so no one could blame her. After leaving with some leftover money, she was found again by demons, who decided that Cy would grow up to be a strong warrior. She then lived with them, learning how to become better at deception and fighting. The first time she saw Habit was when Cy and her group of demons became assigned to fight under Habit. Cy became immediately enamored with him. When she noticed that he was not interested in her, she then went on to discover his attraction to Elza. Therefore, she's insanely jealous of Elza to this day, though she doesn't show this explicitly. She also hides her interest in Habit, though somewhat clumsily. Other - Cy is also quite talented at assassination.